Occasionally, students don’t need to know the exact answer to a maths problem, they just have to come close. That’s where our rounding and estimation worksheets come into play. practise rounding up and down to the tens, hundreds, and thousands, or estimate the sums of multiple-digit maths problems by accessing a variety of activities that are designed to sharpen this critical maths skill. On this year four maths worksheet, kids round to estimate the difference between two numbers, a useful strategy for checking the results of calculations. Maths whizzes can learn to estimate sums quickly using front-end estimation! Round to the highest place value and then add or subtract the rounded numbers. Rounding can take some practise. Give your student the opportunity to master the art of rounding. Use the chart to help him figure out the answers. This worksheet will challenge your third graders to round numbers and then them. Students will answer multiple choice questions by rounding up or rounding down numbers in the problems provided. 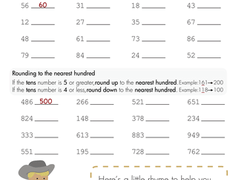 Looking for a worksheet to help your kid with number rounding skills? This printable will help him with year four maths skills. 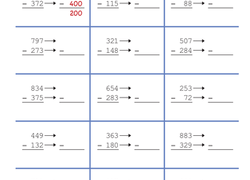 Searching for a worksheet that practices rounding numbers and subtraction skills? This printable uses estimation to subtract three digit numbers. Give your little one a hand and help her hone her rounding skills. She will practise her rounding skills by answering the various questions. Rounding numbers can be tricky. Teach your third graders the rhyme five or more up the score, four or less let it rest. Estimate the sum in each of these maths problems. Challenge your child to round to the nearest hundred first, then add the two rounded numbers. Adding and subtracting large numbers can sometimes be difficult. Estimating is an easy way to figure out if your answer is close, or if you need to try again. Practise place value, rounding and addition, all in one worksheet! Your child will learn to add up estimated sums quickly in his head. This watery worksheet is the perfect way to teach your child how to round to the nearest hundred. Your student will practise her rounding skills with this multiple choice worksheet. Once she's done, she'll be an expert at rounding up and down. Your student will have to figure out which way to go in order to find the answer. DonÃt worry, it's multiple choice. Circle the correct answer.